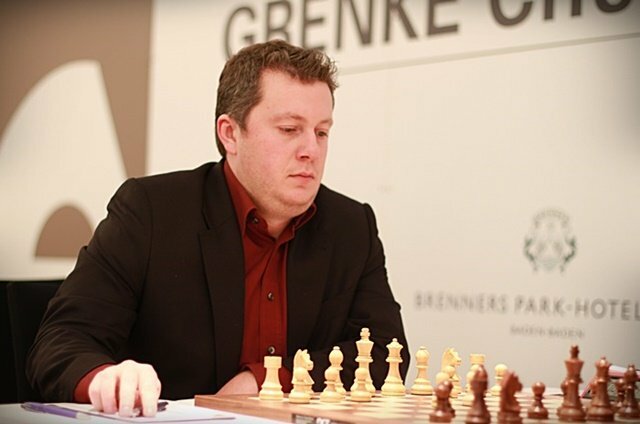 Arkadij Naiditsch has beaten Magnus Carlsen for the second time in a row after the World Champion bashed out a bishop sacrifice that saw Maxime Vachier-Lagrave christen him Magnus Jobava. 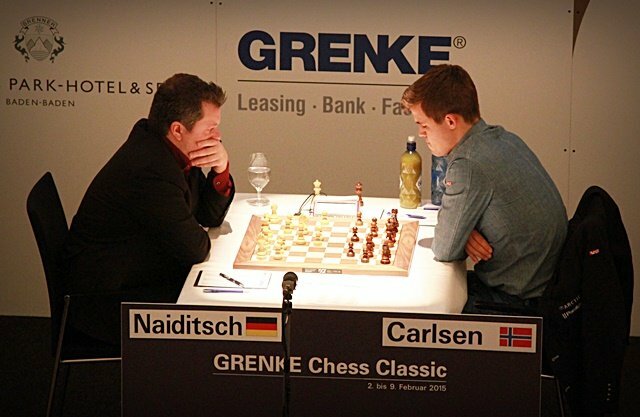 Naiditsch defused any immediate danger, but had to win an epic battle two or three times against Carlsen’s legendary resilience. 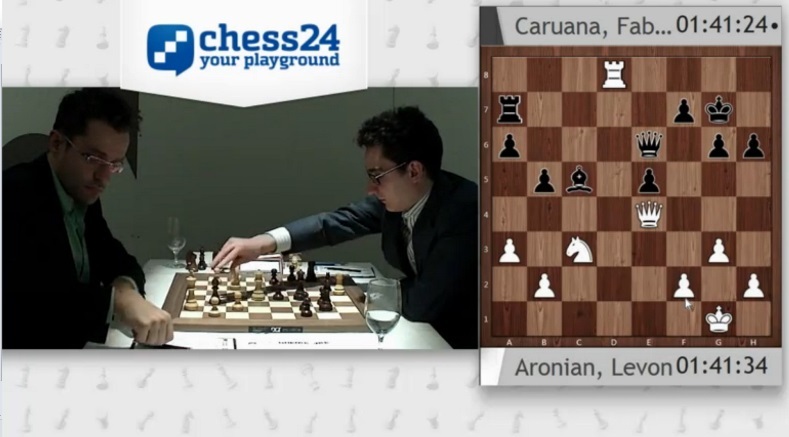 That overshadowed Fabiano Caruana regaining the world no. 2 spot after a ramshackle performance by Levon Aronian, while Michael Adams bounced straight back with a win against David Baramidze. 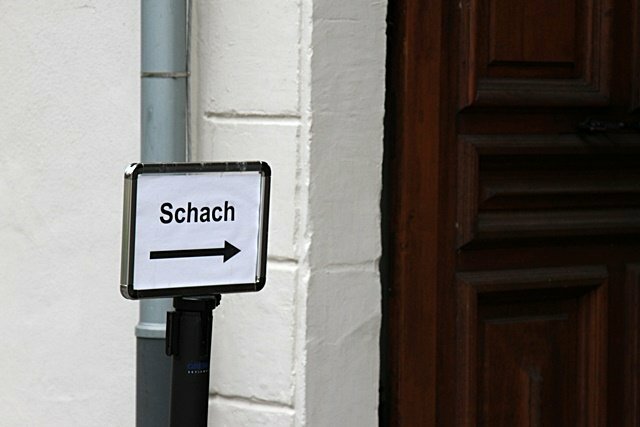 Since there’s no question about the game of the day, let’s whiz through the other action, featuring two wins and a Berlin Wall draw. The problem was 17.axb5 axb5 18.Rxa7! Rxa7 19.Bg5 Qg6 20.Qe3! An unusual double attack, since as well as hitting the a7-rook it prepares Nxe5 or Nh4, trapping the black queen. There was nothing better for Baramidze than to give up material with 20…f6, but the position was objectively hopeless, even if Adams saw some ghosts that prolonged the conversion (they might have prolonged it indefinitely if not for Baramidze’s 25…Nxg2 piece sac – a theme of the day!). And now we get to a truly epic battle. This game requires some backstory. Round 7 of the 2014 Olympiad. Magnus Carlsen leading Norway against Germany goes for a bold winning attempt just before the time control, only to realise too late that it’s one position where a knight and passed pawn outweigh a bishop. 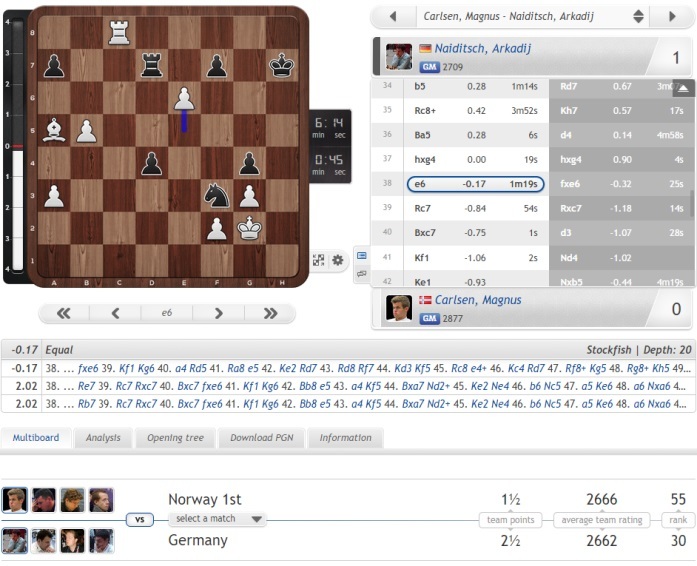 Naiditsch wins a virtuoso endgame and, as the other three games are drawn, Germany beat Norway. 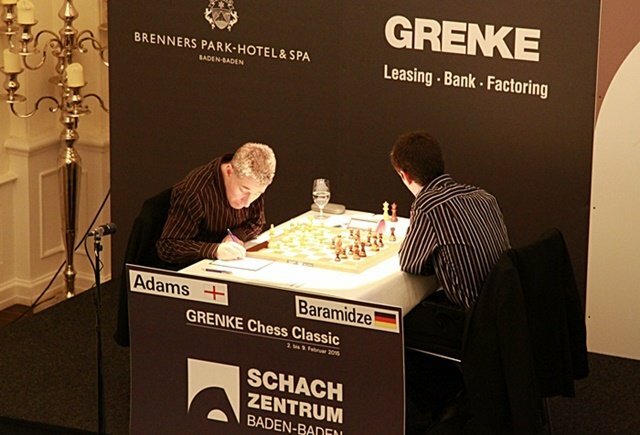 So there was an added edge when the players faced each other in Baden-Baden in Round 3 of the GRENKE Chess Classic. 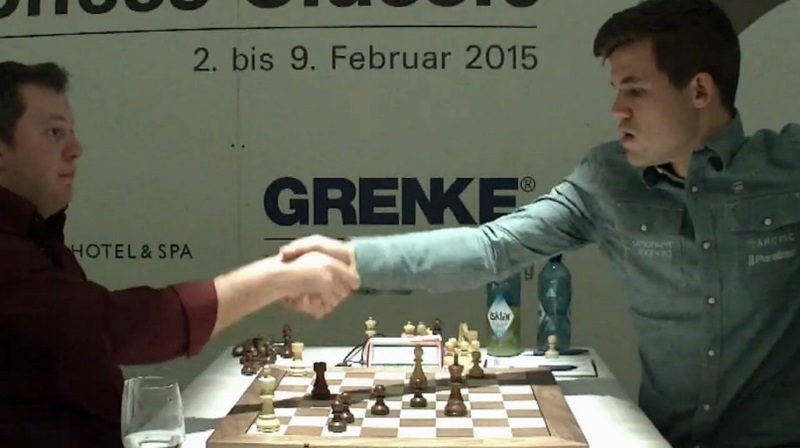 Carlsen had the black pieces this time round, but when he replied to 1.e4 with 1…g6 it was clear he was out for blood. Still, that couldn’t stop 10…Bxg4!? being anything but a huge bolt from the blue! The World Champion had just given up a bishop for two pawns for what was clearly (as any chess engine told the watching world) a speculative sacrifice. Nigel Short in the commentary booth was lost for words, although fortunately not literally! What the heck? What an animal!! He’s out for blood. He wants to bite Arkadij Naiditsch’s head off with this kind of chess. Very brave, very bold. I wouldn’t do it. I’d be chicken. You’re facing this vicious onslaught and it looks as though White has a draw as an absolute minimum. You’ve got to have calculated everything until the end to go for this. I shocked myself completely by not taking on e5. I was very angry at playing 31.Bg2. Against some players you can just wait for them to die. Against Magnus Carlsen you’ve got to stick the stake through the heart and hammer it in. Perhaps it was also partly our common Carlsen complex, though – when Jan Gustafsson asked Aronian who was playing for a win he immediately replied, “Definitely White”. It's a nice feeling, of course, to beat the strongest chess player in the world! 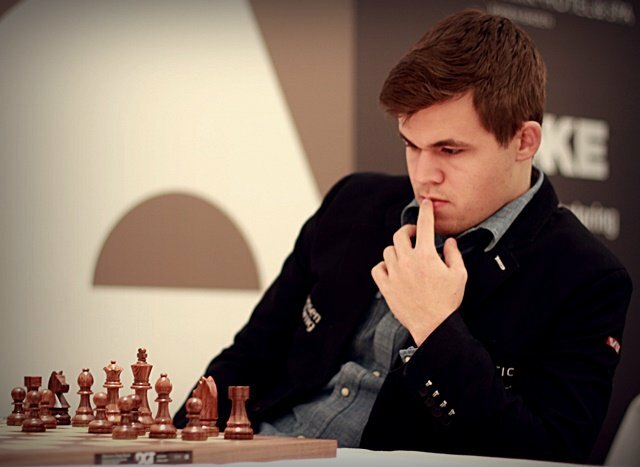 Sure enough, Carlsen lost to Caruana in the third round of the Sinquefield Cup, Anand in the third game of the World Championship match and Wojtaszek in the third round of the Tata Steel Masters. 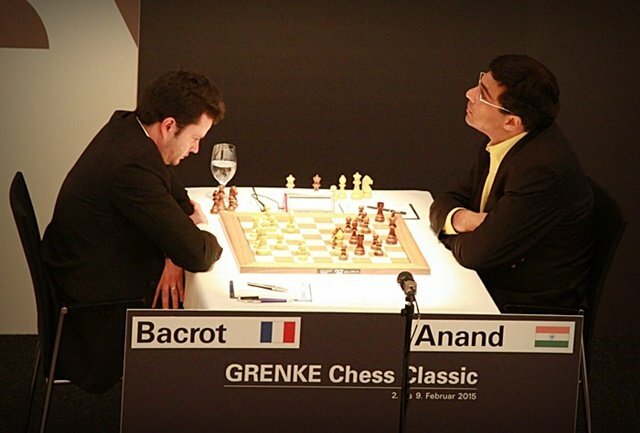 After the Tata loss he did admittedly go on to win his next six games in a row, though as Jan pointed out, that’s problematic when the GRENKE Chess Classic only has four rounds remaining! It’s perhaps not entirely what he needed, but Magnus Carlsen’s next game, after Thursday's rest day, will be his first encounter with Vishy Anand since the World Championship match. He has Black, and will have to decide whether to try something sharper than the repertoire he used in the match, which failed to pierce Vishy’s armour.